Christ The Bridegroom: The week of the bishops! The week of the bishops! Your life has shown you to your flock as a rule of faith, an image of gentleness and a teacher of moderation. You acquired greatness through humility and wealth through poverty. O father and archbishop Nicholas, intercede with Christ our God to save our souls. 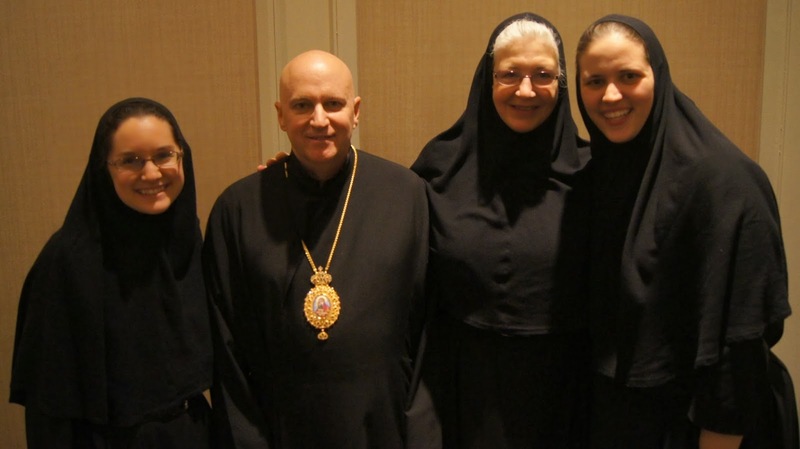 First was the ordination of Bishop Kurt Burnette as the new bishop of the Eparchy of Passaic (New Jersey). For all of us at the monastery, it was the first ordination of a bishop that we had ever witnessed. We were in awe to witness the bestowing of the vocation of apostle and the fullness of the priesthood upon this priest of God. 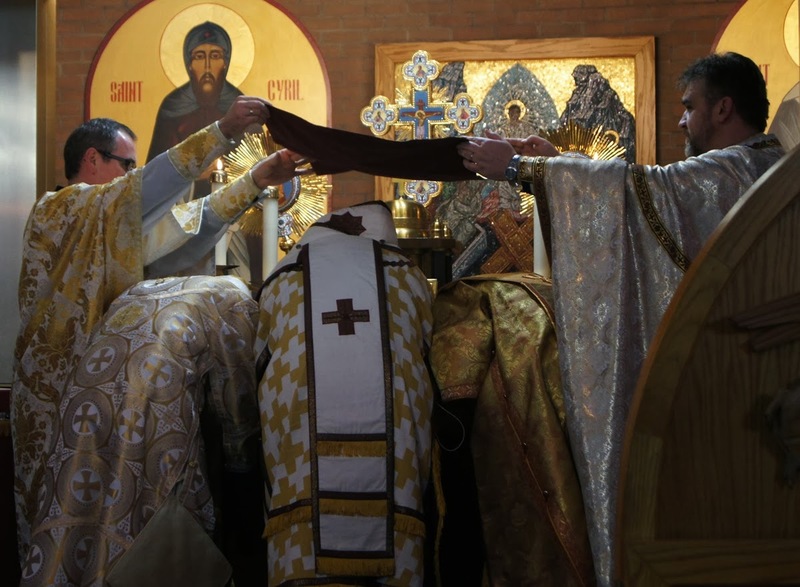 It was a rare gift to see so many bishops participating in a Divine Liturgy: bishops of multiple countries representing various Eastern Catholic Churches, as well as numerous Roman Catholic bishops. We also loved Bishop Gerald's homily. He spoke about the qualities of St. Nicholas, especially his zeal for the faith, gentleness and humility, and set him as an example for Bishop Kurt and all the bishops and priests. We were touched by the way he spoke about humility and his challenge to the bishops and priests to spend an hour each day in prayer. 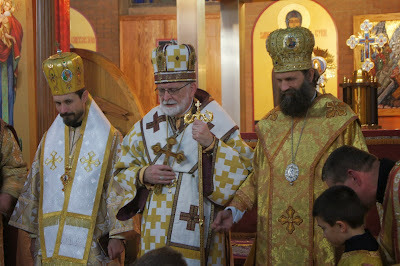 One of the bishops attending the ordination was Bishop Fülöp Kocsis of the Eparchy of Hajdúdorog, Hungary. After the ordination, we had the privilege to drive this bishop home to our monastery. Bishop Fülöp lived the monastic life prior to being chosen as bishop. He received his formation at the famous Monastery of Chevetogne in Belgium and then founded a monastery in Hungary. 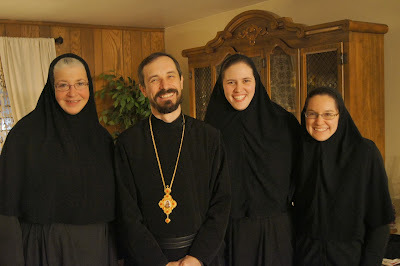 He and the other monk at the monastery were both chosen as bishops, but shortly after the monastery became vacant, three young women approached him with their desire to become nuns. These women have recently begun to live the monastic life in Bishop Fülöp's former monastery. After reading about us in our eparchial newspaper, Horizons, he was interested in meeting us and took this opportunity to visit the monastery and spend some time with us. He celebrated Great Vespers in our chapel for the feast of St. Nicholas and also prayed Matins with us. He and his secretary, Tamas, sang with us in beautiful harmony, and it was one of the most beautiful and moving experiences of prayer we have had in the monastery. In the evening we attended the Divine Liturgy for the Feast of St. Nicholas at St. Nicholas Byzantine Catholic Church in Barberton, Ohio. The three bishops (Bishop John, Bishop Fülöp and Bishop Milan) concelebrated the Liturgy. What a rare gift! 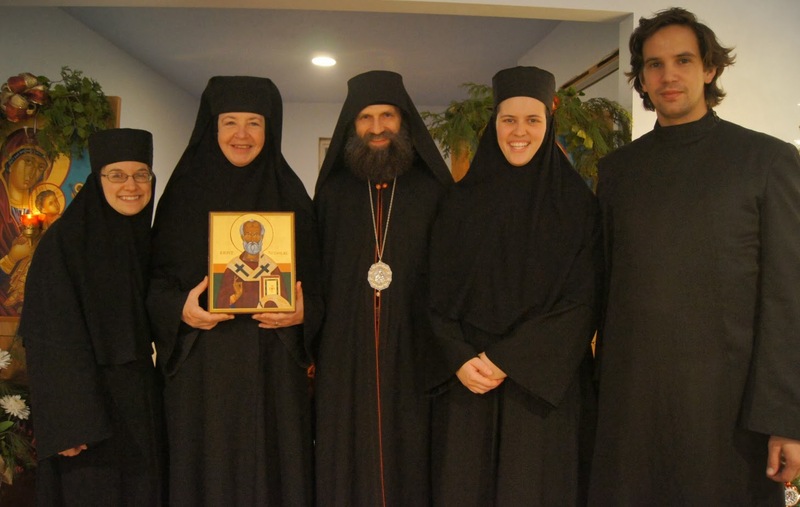 One of our favorite moments was when the three bishops sang the "Agios o Theos" together (the third verse of the "Holy God" which is sung in Greek by the bishop in a hierarchical Divine Liturgy) and harmonized with each other! Bishop Milan also gave a beautiful homily on the qualities of St. Nicholas which we should imitate. "Christian love should be discreet," he said. The Divine Liturgy at St. Nicholas Church, as well as other moments of prayer during those few days, was truly heaven on earth. There were many moments in which we lost all sense of time, and praying with these bishops from other countries spiritually connected us to their Byzantine Catholic flocks -- our brothers and sisters in Christ. The bishops also connected us to the saints who have come before us, especially the bishops and apostles, through the succession of episcopal ordination, and ultimately to Christ. Like St. Nicholas, they emulated the faith, gentleness, moderation, humility and poverty of Christ.